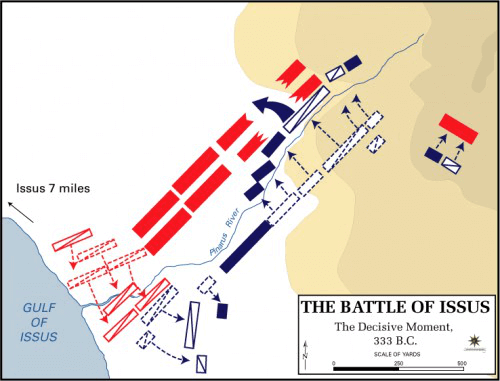 During the engagement at the Battle of the Granicus, Alexander and his army did not have to engage Darius III and the massive hordes of the Persian directly. At the time Alexander was not seen as a threat and it was thought in Persia his invasion was going to be short lived. Darius III and his commanders were proved wrong for sure when Alexander emerged victorious at the Granicus and moved through all of Asia Minor which submitted peacefully as he marched through. The Persian Empire was not going to be so easily defeated however, and soon the stage was set for a showdown between Alexander and the leader of the Achaemenid Empire himself for the fate of all Asia. The Battle of Issus would be a resonating victory for Alexander and directly force the Achaemenid Empire into the final struggle for its survival at the Battle of Guagemela after Alexander first conquered the Persian satrapies of Phoenicia and Egypt. When Alexander won his decisive victory at the Granicus and marched through Asia Minor claiming every territory along the way this was viewed as a great insult to the Persian leaders and could not be allowed to stand. After first sending his general Memnon to tend with Alexander, Darius III himself decided it was time to supervise the destruction of Alexander. Darius III was able to call upon troops from all corners of his empire, even a few mercenary Greeks from Asia Minor. There were even some Greek officers and counselors in the family and court of Darius. One of them, named Charidemus, offended the king very much by the free opinion which he expressed of the uselessness of all his pomp and parade in preparing for an encounter with such an enemy as Alexander. "Perhaps," said Charidemus, "you may not be pleased with my speaking to you plainly, but if I do not do it now, it will be too late hereafter. This great parade and pomp, and this enormous multitude of men, might be formidable to your Asiatic neighbors; but such sort of preparation will be of little avail against Alexander and his Greeks. Your army is resplendent with purple and gold. No one who had not seen it could conceive of its magnificence; but it will not be of any avail against the terrible energy of the Greeks. Their minds are bent on something very different from idle show. They are intent on securing the substantial excellence of their weapons, and on acquiring the discipline and the hardihood essential for the most efficient use of them. They will despise all your parade of purple and gold. They will not even value it as plunder. They glory in their ability to dispense with all the luxuries and conveniences of life. They live upon the coarsest food. At night they sleep upon the bare ground. By day they are always on the march. They brave hunger, cold, and every species of exposure with pride and pleasure, having the greatest contempt for any thing like softness and effeminacy of character. All this pomp and pageantry, with inefficient weapons, and inefficient men to wield them, will be of no avail against their invincible courage and energy; and the best disposition that you can make of all your gold, and silver, and other treasures, is to send it away and procure good soldiers with it, if indeed gold and silver will procure them." The Greeks were habituated to energetic speaking as well as acting, but Charidemus did not sufficiently consider that the Persians were not accustomed to hear such plain language as this. Darius was very much displeased. In his anger he condemned him to death. "Very well," said Charidemus, "I can die. But my avenger is at hand. My advice is good, and Alexander will soon punish you for not regarding it." Very gorgeous descriptions are given of the pomp and magnificence of the army of Darius, as he commenced his march from the Euphrates to the Mediterranean. The Persians worship the sun and fire. Over the king's tent there was an image of the sun in crystal, and supported in such a manner as to be in the view of the whole army. They had also silver altars, on which they kept constantly burning what they called the sacred fire. These altars were borne by persons appointed for the purpose, who were clothed in magnificent costumes. Then came a long procession of priests and magi, who were dressed also in very splendid robes. They performed the services of public worship. Following them came a chariot consecrated to the sun. It was drawn by white horses, and was followed by a single white horse of large size and noble form, which was a sacred animal, being called the horse of the sun. The equerries, that is, the attendants who had charge of this horse, were also all dressed in white, and each carried a golden rod in his hand. There were bodies of troops distinguished from the rest, and occupying positions of high honor, but these were selected and advanced above the others, not on account of their courage, or strength, or superior martial efficiency, but from considerations connected with their birth, and rank, and other aristocratic qualities. There was one body called the Kinsmen, who were the relatives of the king, or, at least, so considered, though, as there were fifteen thousand of them, it would seem that the relationship could not have been, in all cases, very near. They were dressed with great magnificence, and prided themselves on their rank, their wealth, and the splendor of their armor. There was also a corps called the Immortals. They were ten thousand in number. They wore a dress of gold tissue, which glittered with spangles and precious stones. These bodies of men, thus dressed, made an appearance more like that of a civic procession, on an occasion of ceremony and rejoicing, than like the march of an army. The appearance of the king in his chariot was still more like an exhibition of pomp and parade. The carriage was very large, elaborately carved and gilded, and ornamented with statues and sculptures. Here the king sat on a very elevated seat, in sight of all. He was clothed in a vest of purple, striped with silver, and over his vest he wore a robe glittering with gold and precious stones. Around his waist was a golden girdle, from which was suspended his cimeter—a species of sword—the scabbard of which was resplendent with gems. He wore a tiara upon his head of very costly and elegant workmanship, and enriched, like the rest of his dress, with brilliant ornaments. The guards who preceded and followed him had pikes of silver, mounted and tipped with gold. It is very extraordinary that King Darius took his wife and all his family with him, and a large portion of his treasures, on this expedition against Alexander. His mother, whose name was Sysigambis, was in his family, and she and his wife came, each in her own chariot, immediately after the king. Then there were fifteen carriages filled with the children and their attendants, and three or four hundred ladies of the court, all dressed like queens. After the family there came a train of many hundreds of camels and mules, carrying the royal treasures. It was in this style that Darius set out upon his expedition, and he advanced by a slow progress toward the westward, until at length he approached the shores of the Mediterranean Sea. He left his treasures in the city of Damascus, where they were deposited under the charge of a sufficient force to protect them, as he supposed. He then advanced to meet Alexander, going himself from Syria toward Asia Minor just at the time that Alexander was coming from Asia Minor into Syria. It will be observed by looking upon the map, that the chain of mountains called Mount Taurus extends down near to the coast, at the northeastern corner of the Mediterranean. Among these mountains there are various tracts of open country, through which an army may march to and fro, between Syria and Asia Minor. Now it happened that Darius, in going toward the west, took a more inland route than Alexander, who, on coming eastward, kept nearer to the sea. 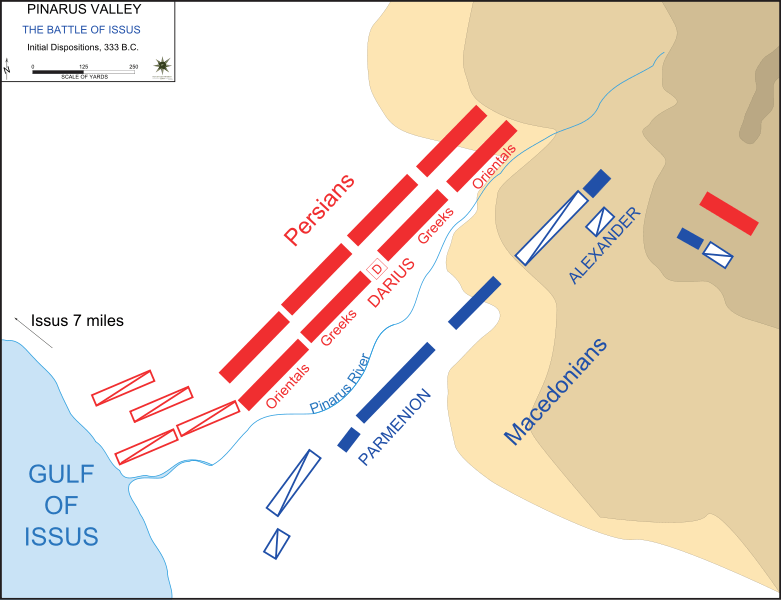 Alexander did not know that Darius was so near; and as for Darius, he was confident that Alexander was retreating before him; for, as the Macedonian army was so small, and his own forces constituted such an innumerable host, the idea that Alexander would remain to brave a battle was, in his opinion, entirely out of the question. He had, therefore, no doubt that Alexander was retreating. It is, of course, always difficult for two armies, fifty miles apart, to obtain correct ideas of each other's movements. All the ordinary intercommunications of the country are of course stopped, and each general has his scouts out, with orders to intercept all travelers, and to interrupt the communication of intelligence by every means in their power. In consequence of these and other circumstances of a similar nature, it happened that Alexander and Darius actually passed each other, without either of them being aware of it. 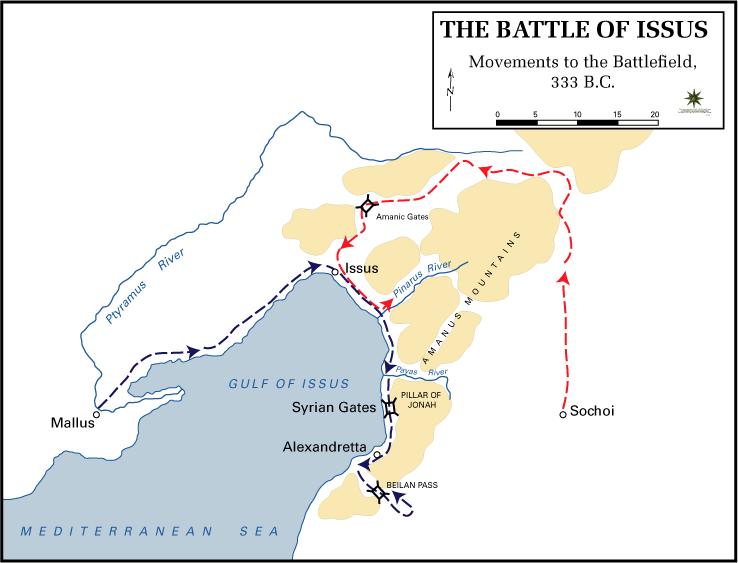 Alexander advanced into Syria by the plains of Issus, marked a upon the map, and a narrow pass beyond, called the Gates of Syria, while Darius went farther to the north, and arrived at Issus after Alexander had left it. Here each army learned to their astonishment that their enemy was in their rear. Alexander could not credit this report when he first heard it. He dispatched a galley with thirty oars along the shore, up the Gulf of Issus, to ascertain the truth. The galley soon came back and reported that, beyond the Gates of Syria, they saw the whole country, which was nearly level land, though gently rising from the sea, covered with the vast encampments of the Persian army. The king then called his generals and counselors together, informed them of the facts, and made known to them his determination to return immediately through the Gates of Syria and attack the Persian army. The officers received the intelligence with enthusiastic expressions of joy. It was now near the evening. Alexander sent forward a strong reconnoitering party, ordering them to proceed cautiously, to ascend eminences and look far before them, to guard carefully against surprise, and to send back word immediately if they came upon any traces of the enemy. At the present day the operations of such a reconnoitering party are very much aided by the use of spy-glasses, which are made now with great care expressly for military purposes. The instrument, however, was not known in Alexander's day. When the evening came on, Alexander followed the reconnoitering party with the main body of the army. At midnight they reached the defile. When they were secure in the possession of it, they halted. Strong watches were stationed on all the surrounding heights to guard against any possible surprise. 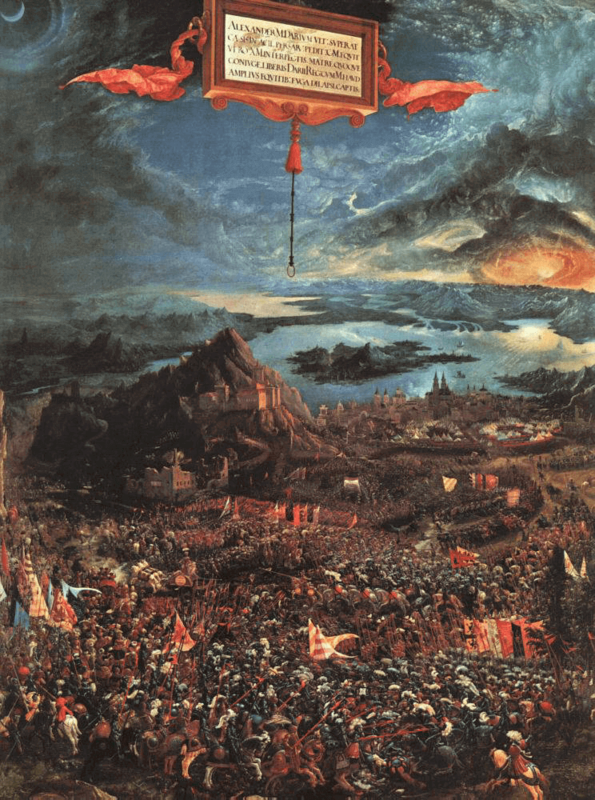 Alexander himself ascended one of the eminences, from whence he could look down upon the great plain beyond, which was dimly illuminated in every part by the smouldering fires of the Persian encampment. An encampment at night is a spectacle which is always grand, and often sublime. It must have appeared sublime to Alexander in the highest degree, on this occasion. To stand stealthily among these dark and somber mountains, with the defiles and passes below filled with the columns of his small but undaunted army, and to look onward, a few miles beyond, and see the countless fires of the vast hosts which had got between him and all hope of retreat to his native land; to feel, as he must have done, that his fate, and that of all who were with him, depended upon the events of the day that was soon to dawn—to see and feel these things must have made this night one of the most exciting and solemn scenes in the conqueror's life. He had a soul to enjoy its excitement and sublimity. He gloried in it; and, as if he wished to add to the solemnity of the scene, he caused an altar to be erected, and offered a sacrifice, by torch-light, to the deities on whose aid his soldiers imagined themselves most dependent for success on the morrow. Of course a place was selected where the lights of the torches would not attract the attention of the enemy, and sentinels were stationed at every advantageous point to watch the Persian camp for the slightest indications of movement or alarm. In the morning, at break of day, Alexander commenced his march down to the plain. As Darius came closed to being killed the Alexander and the companion cavalry he immediately began a hasty retreat on his chariot, leaving behind his mother, wife and the rest of his family as he disappeared into then night. When the road ended and he could take the chariot no further, Darius mounted his horse and continued to run throughout the night. After winning the Battle of Issus, Alexander did not need to chase Darius into the night as he was already done for. The Battle of Issus proved once again that Darius had underestimated his Greek foe and that was going to cost him dearly. As Caridemes said, the pomp and luxury of the army was going to be his undoing the relentless Greeks. After the Battle of Issus it would be several years before Alexander and Darius would have their final showdown at the Battle of Gaugamela. However, after watching the Persian army scatter into the sunset, the Macedonians turned back towards the Persian camp in order to plunder all of its worth. At the Persian camp Alexander and his army found all sorts of gold and silver objects along with valuable caskets, vases, perfumes, incenses and every other imaginable item of luxury. As Darius's mother, wife and family pondered their fates, Darius continued to flee for safe territory. Ultimately Alexander would let Darius retreat and offered mercy towards his enemies family. While letting Darius amass his forces for the upcoming Battle of Guagamela, Alexander in the meantime focused his efforts on subduing the other territories of the Achaemenid Empire first.